I don’t know about you, but I love a good pasta dish! 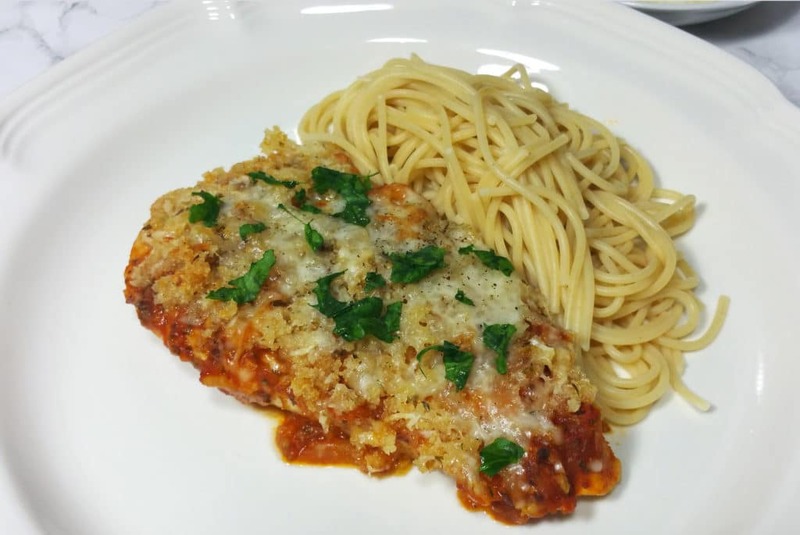 This one reminds me of a Chicken Parmesan recipe. 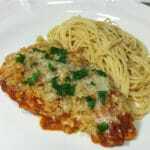 The breadcrumb topping on this recipe has a flavorful buttery taste that is beyond fantastic! And yes I said breadcrumb topping, but you know by now that I found a way to make a Gluten Free version of this dish! It amazes me how much my 2 kiddos help me decide what recipes are worth repeating and what recipes just don’t make the cut. A lot of them just don’t make it. My kids have high expectations and set the bar high! Well, I’m happy to tell you that this one passed the kid test with flying colors! They loved it and ate every bit! 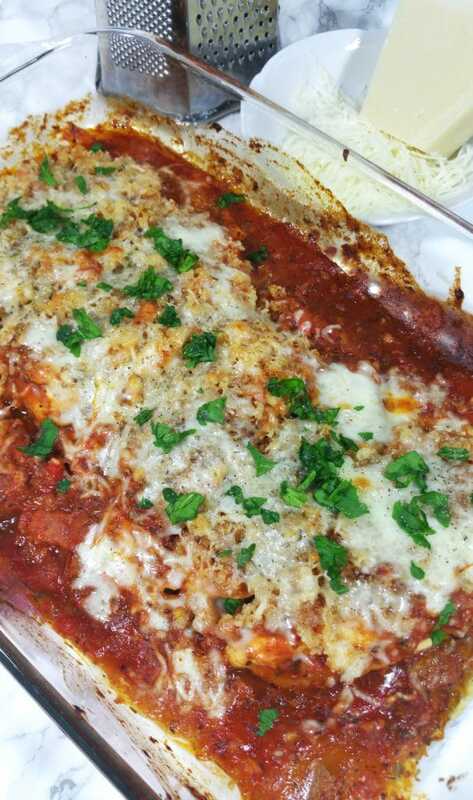 The mix of fresh basil and mozzarella taste is spot on in this dish. 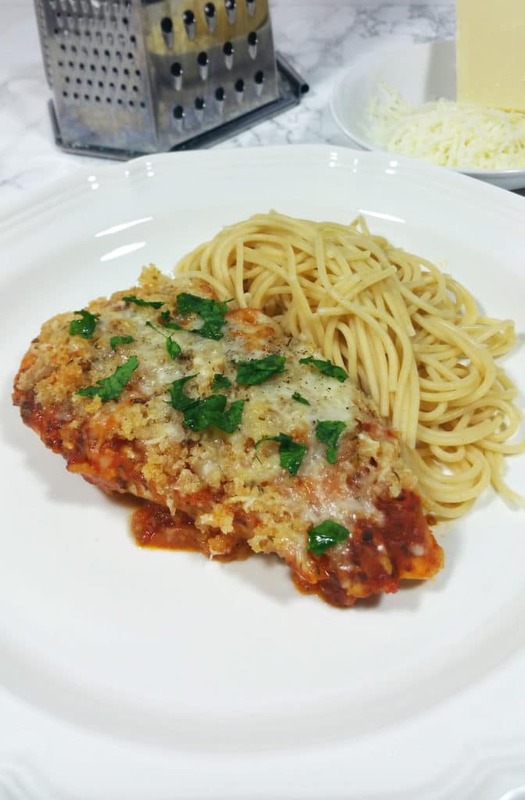 I tend to use my homemade spaghetti sauce (which you can find here: Homemade Spaghetti Sauce) when making this dish, but if you are in a hurry you can use store bought pasta…your call based on your schedule and time! 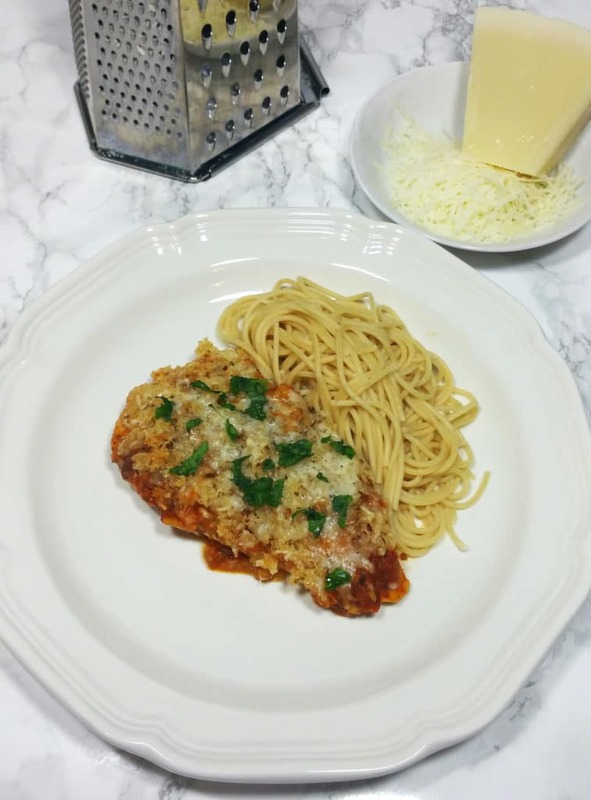 We served this with a small side of pasta, but you could very easily serve this with a fresh side salad and skip the pasta. This one is fast and easy to make. I guarantee your family will love this one! Happy Eats! Preheat oven to 400. Heat a large skillet over medium heat. Add panko to the skillet and sauté for 3 minutes or until it turns a light brown color. Remove panko from skillet and add to a small bowl. Combine the Parmesan cheese and butter into the small bowl with the panko and stir well. Next, heat a pan over medium high heat. Add 1 teaspoon oil to the pan and spread evenly. Season chicken with 1/4 teaspoon of salt and 1/4 teaspoon of pepper. Add chicken to the pan and cook for 5 minutes. Turn and cook chicken another 3 minutes. Remove chicken from pan and set aside. Add remaining 1/4 teaspoon salt, remaining 1/4 teaspoon pepper, tomato, marinara sauce, chicken stock and 2 teaspoons of fresh oregano to pan and stir well. Return chicken to pan and bring to boil. Once the mixture boils, remove chicken and sauce from the skillet and add to a glass Pyrex dish. Sprinkle panko mixture and mozzarella over top of the chicken breasts. Place cooking dish in the oven and bake at 400 for 10 minutes, or until chicken is done. Top with remaining fresh oregano and fresh basil.